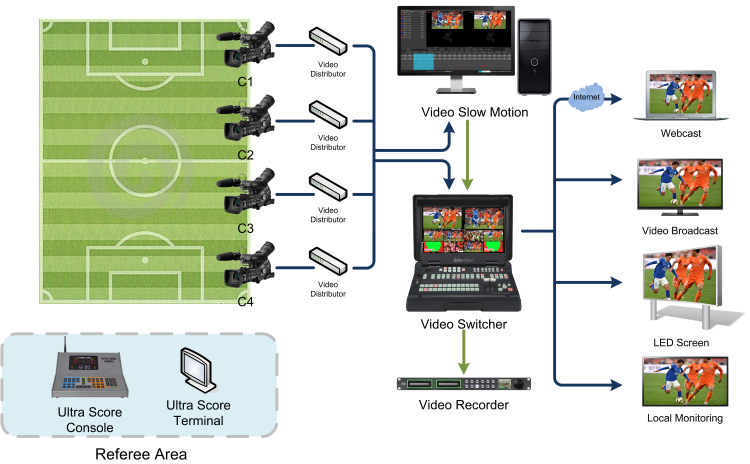 The system is for high definition video slow playback which can be widely used in live sporting events, with the functions of HD video recording and slow motion replaying. It can provide the producer with rich live videos from multi-camera in different angles so that they can do quick local edition locally for living, TV and Internet broadcast. 4 channels video recording and instant replaying simultaneously. SDI Input in 1080P mode. Slow playback the great shots in different speed, in multi-angle with broadcast quality video signal. Live slow-motion video can be used for network broadcast, LED display and local preview. Integrated with Title maker system, to show the live-score on the slow-motion video synchronously.